Overview: The Andean Cosmovision is a way of perceiving and interacting with reality that is found in the indigenous culture of the high Andes. It is fundamentally different than the Western worldview. This Cosmovision is not a set of concepts or beliefs. It cannot be described or encompassed by words. It can, however, be experienced and it can be explored. This exploration is carried out through meditations which serve as portals for exploring new facets of ourselves and the Cosmos. These meditations also nourish a more loving and mutually-supportive relationship between ourselves and nature. Within this relationship we begin to blossom into the essence of who we each uniquely are. 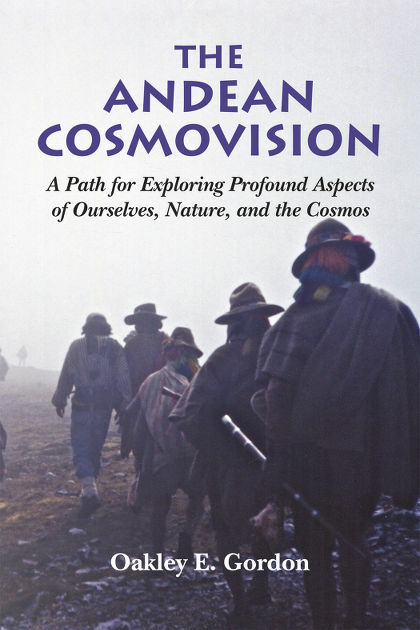 This is a guidebook for exploring the Andean Cosmovision. For this path you don't need a guru. You need the Pachamama (the great being who is the mother earth); you need the Apus (the great beings who are the majestic mountain peaks); you need the stars, the wind, the trees, the rivers, the sun. This book will open the door to new territory and give you a map and some advice. It will then be up to you to determine whether what you find is in harmony with your deepest values. Oakley Gordon received his doctorate in cognitive psychology (the study of perception, learning, memory, and consciousness). For the past twenty two years he has been exploring the Andean Cosmovision under the tutelage of his Peruvian mentor and friend don Americo Yabar. In his trips to Peru Oakley has also worked with many other Andean paqos (mystics/shamans) and healers. He has shared the Andean Cosmovision with Western society through papers at academic conferences, presentations to the public, a few articles, an extensive blog, and several hundred experiential classes and workshops. Over many years of going to Peru to learn the Cosmovision, coming home to integrate it with his life in the West, and then teaching it to others, he has reached the point where he could write this book. It comes from his heart (with help from his intellect). Amazon.com, Amazon.co.uk, Amazon.de, Amazon.fr, Amazon.it, Amazon.es.